Birds 1 consist of birds of a geometric nature concerning their outline, of one motif, all based upon an underlying square. Of perhaps more interest than normal is the background to this tessellation (but not concerning the bird motif, of my own devising). Interestingly, Escher made a study of it, but obviously did not see its potential as regards the representational (bird motif) aspect. This tessellation has as its ultimate source an illustrated article by George Pólya titled ‘Über die analogie der Kristallsymmetrie in der Ebene’ in the crystallography journal Zeitschrift für Kristallographie, of 1924, in which he gives 17 diagrams representing the different plane symmetry groups. Four of those are original with Pólya for this purpose, including the one that the above is based upon, denoted as C4. (Both the relevant diagram and Escher’s studies of it are in the book Visions of Symmetry, pages 23 and 25.) However, as it is such a 'simple' outline, it would appear to be most strange if this was in fact its first appearance. If anyone has seen this tile from a earlier source I would be interested in hearing details. 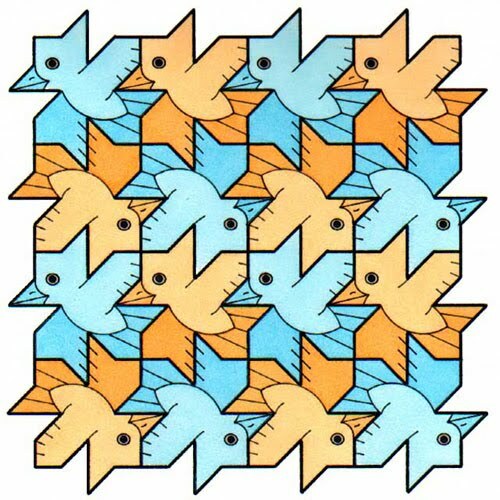 Escher’s interest in this particular tessellation began when he undertook in 1936 his first ‘serious’ studies of tessellations. This involved studying various tessellation-type articles (more specifically the diagrams only) from journals (supplied by his half brother B. G. Escher, a geologist), of which the above article was of the most interest to him, as he stated himself, making a thorough study of the diagrams. However, despite such an considered study, he missed the opportunity of a bird motif as above. Of interest is just how appropriate the outline is for a bird motif, of which it is most surprising that since its apparent inception by Pólya no-one else had noticed its potential before myself (in 1989). 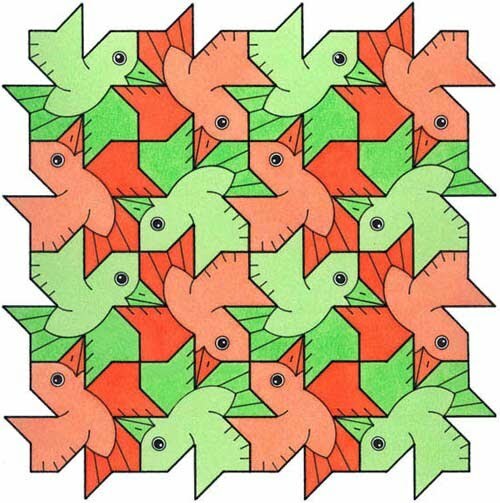 Indeed, this particular tessellation is a favourite of mine, as it consists of a bird motif which, despite having a geometric outline that can be described as ‘simple’, nonetheless it leads to a motif that I consider to be of the highest quality, which is hopefully obvious even by a casual perusal of the tessellation. Another, additional aspect to this tile unrelated to the above 'background matters' is that it as it possesses order 4 rotational symmetry, which thus has variations concerning the ‘placement’ of the motif. The example here consists of a rotational type whereby all four orientations of the bird motif are shown, in effect what I term as 'fulfilling its potential', as all of the orientations are used (this being in contrast to a translation, which would only use one orientation). This is shown as the most basic colouration of a two-colour complementary combination scheme with red and green. However, arguably, this would have been better coloured with four colours, thereby emphasising each of the four orientations. 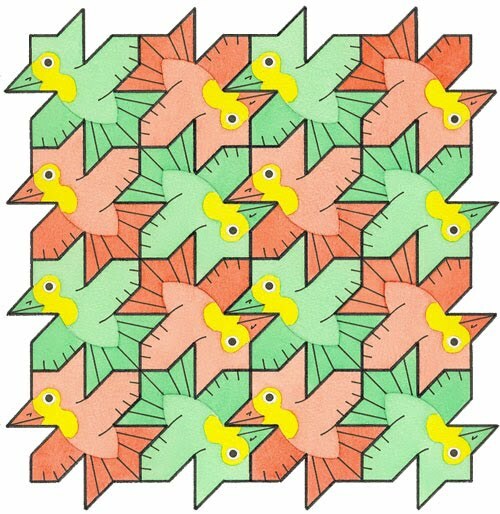 Again, this tessellation is of more interest than normal due to its background, as it has a Escher link. 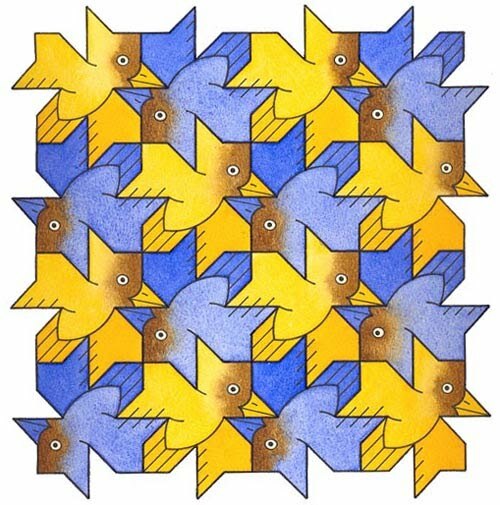 This tile but not the tessellation or the motif can also be found alongside Escher's study of Pólya's illustrations, page 25, denoted C4, albeit it is not in fact one of Pólya's per se, but is instead a creation of Escher's, perhaps experimenting in using the same line, albeit arranged differently. However, quite what Escher is intending here is unclear. Whatever, he again missed the opportunity for a bird motif, as shown by the example above. Of interest is that the motif has more than one way of being 'placed' in a single tile, due to, in this instance, mirror symmetry. Consequently, there are thus two distinct placements for any one tile. The example above shows the most simplest, of two orientations. Observe that the colouration chosen is somewhat more involved than with a more orthodox example of two contrasting colours. A basic two-colour complementary scheme of blue and orange is chosen, reflecting the two orientations of the motif, with the birds' head, for the sake of innovation given a third colour, brown. The colouring uses a technique known as ‘wet in wet', whereby the colours blend. Although the bird may appear at first sight to be a little strange, with a 'odd, pointed protuberance' emanating from its head, this can be explained by regarding this as a crest (albeit admittedly highly stylised) that some birds possess. A basic red and green complementary colouring scheme is chosen, with for the sake of variety the head and neck areas being of a third colour, yellow. A basic blue and orange complementary colouring scheme is chosen, of ‘one bird, one colour’. 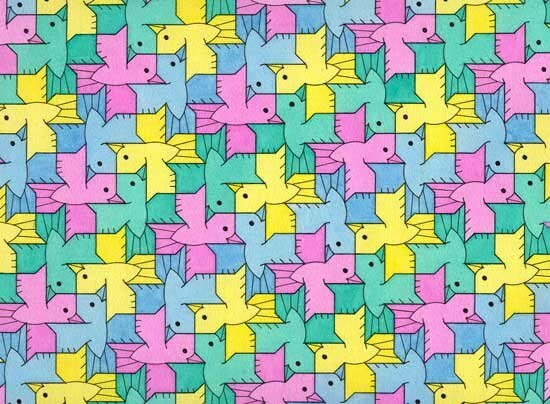 Of perhaps more interest than normal is the background to this tessellation (but not concerning the bird motif, of my own devising). This is an example of a hypersymmetric tessellation (although I am by no means an expert on the subject), of which Branko Grünbaum has written about in Congressus Numerantium. Escher also seems to have been familiar with this outline, as his drawing 127 appears to be a variation. Doris Schattschneider in Visions of Symmetry, page 317 briefly discusses such hypersymmetric tiles. 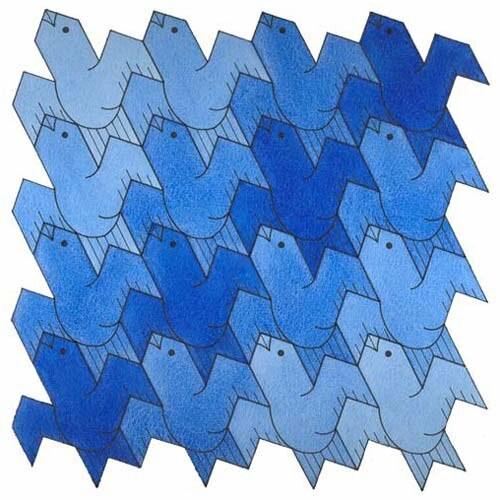 The most notable feature of this tessellation is the colouration, using different shades of a single colour, blue. Although above I state that this requires a minimum of two colours, whilst this has apparently only one, the different shades of blue can be regarded as distinct colours in their own right, so as their are four distinct shades, this is thus a 'four-colouring'. As there is a lack of obvious contrast as when two distinct colours are used, such a colouration scheme is thus used sparingly, in effect as a variation on the more usual colouration schemes of definitive contrasts. Again, a high quality bird motif, with a ‘real-life' appearance, as its outstretched wings are in a parallel position, along with a clearly defined distinct beak and tail. A feature of this tile is that it possesses order 4 rotation, which thus opens up possibilities of placement variation of the motif. This example shows the motif in all four possible orientations, in effect 'fulfilling its potential', this being in contrast to an example in which only a single orientation is shown. Also, an additional feature is that the bird here has both ‘under' (magenta, green) and ‘over' (blue, yellow) views. Although two colours would suffice, as the motif appears in four orientations, four colours are chosen to emphasise this aspect, rather than the minimum two.